Thanks to its strategic position near the Via Gallica, the hill of Rivoli has been inhabited by humans at least since Roman times. A fortified building, the “Castrum Riuollum,” is first mentioned in 1159. The earliest illustration, dating to 1609, shows a central tower surrounded by constructions of varying sizes, while along the foothills a garden softens the complex’s military appearance. The property of the Bishops of Turin, the Castello became part of the Savoy dominion in 1247 and remained so until 1883, the year in which it was sold to the City of Rivoli. In 1350 it was selected as the setting for the marriage of Bianca of Savoy to Galeazzo Visconti. When Emanuele Filiberto chose Turin as the new capital of the Duchy, he settled in Rivoli with his court; his heir, Carlo Emanuele, was born at the Castello on January 12, 1559, under the care and guidance of Nostradamus, who had been invited to follow the pregnancy of the Duchess Margherita of Valois. The new duke, Carlo Emanuele I, entrusted the Castellamonte architects Francesco Paciotto and Domenico Ponsello – father and son – to transform the medieval manor into a leisure residence, as illustrated on the two boards of the Theatrum Sabaudiae (Savoy Theatre), a celebration through images of the city, the fortresses, the residences and all the beauties of the Duchy. Here we see for the first time the Manica Lunga, a building designed to house the picture gallery of Carlo Emanuele I, joined to the castle by four tall towers, and the church dedicated to San Carlo Borromeo, which was never actually built. The work was completed in 1670. By this time the Castello had already hosted important events, such as the birthday celebrations of Christine of France, the second Madama Reale, held on February 10, 1645. The only hall that has survived from that period, after the French troops of Marshall Catinat burned down and destroyed most of the building in 1690 and 1693, is the room of Amedeo VIII on the second floor. Seeing the building burn from Turin, the young duke Vittorio Amedeo II promised himself that he would rebuild and make even more beautiful the residence that has always been so connected to the history of his family and which he greatly loved. In fact, it was from Rivoli that he announced his rise to the throne in 1730. After twenty years of war, it was time for Rivoli to be reborn, and the architects of Louis XIV’s lavish palace at Versailles were consulted. The earliest projects were by Michelangelo Garove, who designed the Stradone del Re, today Corso Francia, a spectacular road that leads to the new palace. The building was enlarged and the damaged towers were demolished; those at the front were replaced by a system of double staircases, in the style of Leonardo da Vinci, which still lead from the ground floor to the top floor, without entering the rooms. 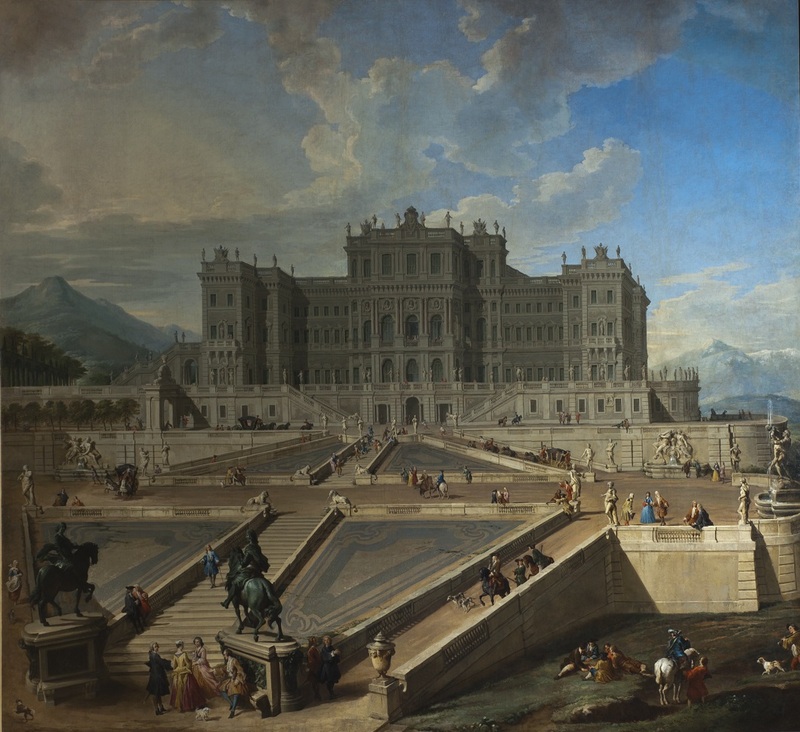 It was with Filippo Juvarra, who arrived in Turin in 1715, that the great palace project would begin to take shape, leading on from the work of Garove, who had died in the meantime. The palace would become a new symbol of Vittorio Amedeo II’s absolute power – he had also been crowned King of Sicily. This was to be a place that could rival other royal residences across Europe – though the dream remained unfinished. It can be appreciated in its entirety only thanks to a magnificent wooden model by Ugliengo, and the paintings of the most important view painters of the age. Juvarra’s lavish, spectacular building – without the Manica Lunga, which he intended to demolish – was to comprise an imposing central corpus surrounded by two identical wings, crowned by balustrades and statues in full Juvarra style. Inside, refined apartments were decorated by painters from across Italy, with precious furnishings that have unfortunately been lost. In the end, the elegant atrium and the imposing ballroom on the first floor were never built, due to excessive construction costs in 1734, as well as the tragic events tied to the imprisonment here of Vittorio Amedeo II in 1731. Today, we see the point where the work came to a halt in the impressive open-air entrance, where the base still awaits its columns, which remained in the quarries of the Valle di Susa. The staircase is only a few steps of unfinished brickwork. In 1793, work began again at Rivoli, but the Golden Age had passed. The Castello was inherited by the second child of Vittorio Amedeo III, Vittorio Emanuele Duke of Aosta, and his wife Maria Teresa of Austria-Este, and work resumed with a new architect, Carlo Randoni, who wished to pick up where Juvarra had left off. Dating to this period is the apartment on the second floor, with its totally renewed look inspired by the English style, in line with new ideas brought to Piedmont by certain enlightened aristocrats, who fostered contacts with artisans arriving in Rivoli. Also dating to this period is the staircase, of which practically nothing remains; its steps, along the wall of the inner atrium, were demolished during restoration between 1979 and 1984. During the Napoleonic period, the Castello was closed, as were the majority of other residences. Many of its furnishings were no longer present, though some were taken to Turin. The emperor decided to give the complex to Marshal Ney, Prince of Moscow and head commander of the Legion of Honor. The restoration work was resumed by Randoni, but by then the Castello di Rivoli had lost its importance. To cover costs, it was fractioned off and rented by the Municipality. The decision to connect the Castello with the Manica Lunga dates to those years. After five centuries, in 1883, for the price of 100,000 lire, the Castello passed from the Savoy family to the City of Rivoli, and was then rented to the army; the soldiers, who until 1909 occupied the building, devastated and damaged it. In 1909 and 1911 the castle’s ancient splendor made a brief comeback, thanks to two exhibitions, but more looting and military occupation followed during World War II, now by German soldiers. War bombings left deep wounds, which were tentatively repaired in 1948, with the first emergency work carried out by the Genio Civile. In 1961, with the Centenary of the Unification of Italy, the Castello di Rivoli, which up to then had been a silent and awkward presence for many years, was allotted a significant amount of funding – 1 billion 120 million lire – though this was not enough to salvage the entire construction. Nearly 300 evacuees were living in the Manica Lunga, along with various small businesses: a sawmill in the courtyard, a food shop, a mechanic’s shop, and a stable. Initial work took apart the structures in the atrium built during the military occupation, and the terracotta decoration on Juvarra’s unfinished work was finally brought to light and cleaned. In 1969, a proposal was made to open a casino in the building, as had already taken place for two months in 1945, but nothing ever came of the idea. There was new hope for Rivoli, however. Funding began to arrive and the architect Andrea Bruno, whose name is tied to the complex’s rebirth, provided the first projects. Almost all the exterior doors and windows had disappeared, stucco work and paintings had been damaged through rain and dampness, tapestries were destroyed, woodwork had rotted. The first collapses took place in 1978, with the large vault crumbling to pieces in the grand hall on the second floor. After numerous warnings, the Piedmont Region, decided to intervene, and the complex was entrusted on an extended loan of 29 years, so as to give the Castello a public and cultural purpose. Coming to the aid of Rivoli was Marquis Panza di Biumo, an important contemporary art collector, in search of a venue where he could install a part of his collection. From 1984 to 1986, Andrea Bruno began working on the Manica Lunga, but unfortunately a lack of funds closed down the site, which reopened only in 1996. It was in February 2000 that the building, first born to host Carlo Emanuele I’s picture gallery, refound its age-old splendor. The structure was maintained with the inclusion of the vault’s overturned hull-shaped steel cover and the steel and glass stairs joining the 17th-century structure. The large windows light up the rooms of the cafeteria, which has also become a treasure trove of works from the collection, and of other Museum services. Even the contemporaneity of the small parallel section that hosts the one-Michelin star restaurant Combal.Zero dialogues with the past, as do all elements of the Castello di Rivoli.